In clinical dentistry, the human skill and manual dexterity are of extreme importance. The surgical precision can be even achieved manually provided with visual acuteness, but this could be enhanced multiple times making use of good magnifying devices. Usage of microscopic magnifying devices has revolutionized the dental practice. This is indeed an evolution from the conventional methods of macrodentistry to a high precision microdentistry. Almost all spheres of precision dentistry have adopted these microscopic devices. There are several major advantages in microsurgical techniques while compared with conventional macrosurgical procedures. The new method offers advanced results in connection with passive wound closure and also significant reduction in tissue trauma, which results in rapid healing. This was not previously possible in traditional macrosurgical techniques. The determination of potential areas for the usage of magnification and/or the tangible use of magnification devices in clinical practice of dentistry is not explored much. The reports and literature in this regard are relatively few. However, such devices are used extensively in connection with operative techniques , and there are numerous reports available in this regard. This article sheds light on several existing magnification systems, its principles, and its numerous applications in microsurgery in different fields of dentistry. The use of magnification for microsurgical procedures is not a new concept. The first magnifying devices to assist surgery were introduced to the field of medicine during late 1800s. Nevertheless, the first surgical microscope OPMI 1 was introduced in 1950. This instrument, which was invented and commercially marketed by Carl Zeiss Company, had a coaxial lighting system and an option for stereoscopic view. However, this instrument failed to gain acceptance by the medical fraternity because of its poor configuration and too-long focal length. The first microscope for dentistry was introduced by Apotheker and Jako in 1978. In endodontics, microsurgery has been practiced since 1986. In 1992, the microsurgery was also introduced to the specialty of periodontics. To comprehend the said topic in a better way, it is essential to understand the various terminologies of microsurgery and also the physics of magnification. This is a phenomenon of visually amplifying and availing an enlarged, exaggerated, intensified view of an object or an image or a model. 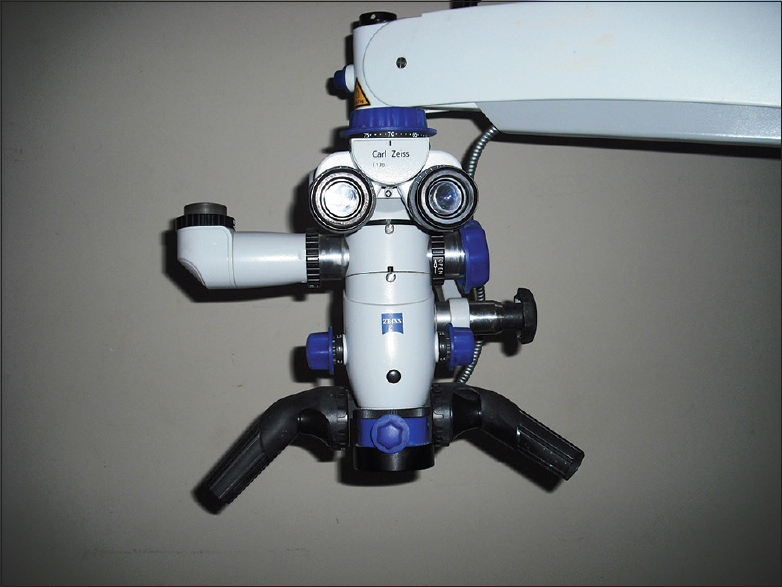 The surgical operating microscopes unlike loupes offer several different options of magnification within the same instrument. Such instruments used by the dentists for microsurgery has six steps of magnification (2.5x, 4.0x, 6.7x, 10x, 16x, and 24x). This is the distance between the plane of the eye of the operator and the surface subjected for the surgical treatment. 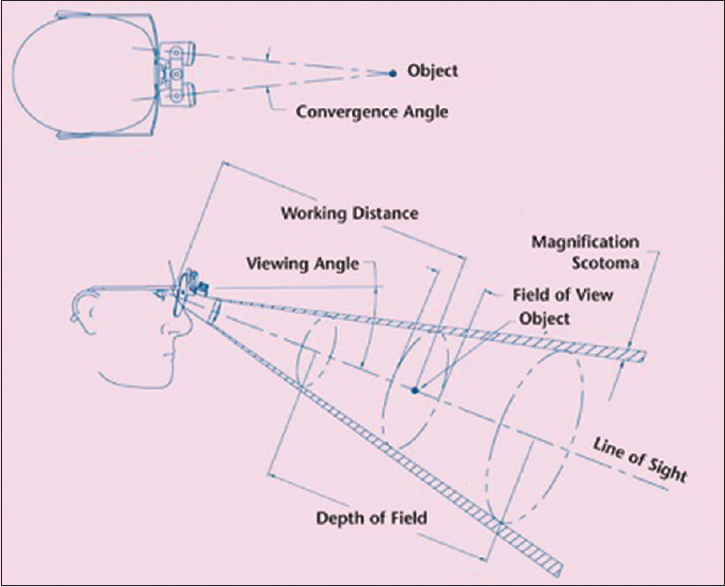 The determination of this working distance is done by the linear measurement of the distance between the objective front lens of the microscope and surgical site. A fairly longer working distance facilitates the operator to perform comfortably with the help of the magnified vision. This is the range within the appropriate working distance, where the operator has the ability to maintain visual accuracy. This is also often referred as "field of view." This represents the width and height of the area the operator sees while using the magnification device. Periodontal microsurgery is a kind of fine-tuning of the rudimentary periodontal surgical techniques. This is conceived through the enhancement in visual sharpness gained by using the surgical microscope. Minimal tissue trauma, which is accomplished through smaller incisions and reduced surgical field. In the course of microsurgical procedures the manifestation of the physiological tremors are common and natural. This will result in undesirable hand and finger movements. In order to reduce and minimize such mild tremors, the microsurgeon must possess anunperturbed state of mind. He should have a comfortable body posture, stable grip, and position while handling the instruments. Above all the attitude of the surgeon plays a vital role. Others (suture materials and needles). The modern day dentist has numerous magnification systems to choose from. These magnifying systems range from simple loupes to compound prism telescopic loupes and vast variety of surgical microscopes. Each magnification system has its own advantages and also its own limitations. Fundamentally these loupes are made up of two monocular microscopes with lenses positioned side by side and angled in such a way to focus on a single object. Devices of each category may differ widely in construction of the lens and design. Simple loupes consist of a pair of single, positive, side-by-side meniscus lenses. Each lens has two refracting surfaces. The first refraction occurs when light enters the lens, and the other refraction happens when the light leaves. The magnification of simple loupes can be increased only by enhancing the lens diameter or increasing the lens thickness. The size and weight are the limitations of these devices, so they do not have any practical applications in dentistry. Compound loupes have an array of convergent multiple lenses. There are air spaces in between these lenses which gives an additional refracting power, magnification, working distance, and depth of field. Such loupes can be easily adjusted as per the clinical requirements by lengthening or shortening the distance between the lenses. Compound lenses can be achromatic, and this feature is to be given importance while selecting a dental loupe. These achromatic lenses are efficient in producing a color perfect image. As their name itself suggest, these loupes consist prisms which are used to refract light rays. These loups have prism fixed at the top, i.e., they are called as rooftop or Schmidt prisms. These prisms are used to lengthen the light path through a series of switchback mirrors positioned between lenses. This system hence provides better magnification, wider depths of field. This also ensures the users to have long working distances and if compared with other loops they have larger fields of view. So these loupes are optically most advanced type of magnification instrument in the market at present. The ranges of magnification of these loupes are around 1.5x to 6x. Generally the dentists use magnification loupes of range 2.5 to 3.5. However, periodontists prefer magnification of 3.5 to 4.5-fold. In case of surgeries done on delicate tissues requires loupes that magnify 5.5 to 6.5-fold. Microscopes with higher magnification are always in demand. The higher magnification makes the job easier for the microsurgeon. The control over micromotor muscles and joints like fingers and wrists are of utmost importance in microsurgical procedures. To achieve this control, gross motor joints such as elbow and shoulder should be in stable position with micro surgeon's chair. Shanelec and Tibbets  have reported that the microsurgeon operating without the aid of magnification, made movements that were measuring up to 1 to 2 mm in real time. When a 20x magnification was used, movements were astonishingly refined to an insignificant 10 to 20 microns (10-20/1000 of an mm) in real time. The noteworthy observation is that the precision achieved in the surgical procedure is not related to the hands or the fingers, but it is more directly related to eyes, i.e., the vision. [Table 1] shows several magnification systems and their resolution in millimeters. The powerful magnifications that are more than 16x, or in some instances as high as 32x or 40x, are commonly used for diagnostic purposes. Using such microscopes very minute details could be examined. Intra-surgical examinations and some type of "difficult-to-detect" findings are located using such microscopes. However, such degree of highest magnification has also some drawbacks. The depth of field in the area of focus will be extremely reduced causing considerable tiredness to the eyes of the viewer. In any surgery, at least two people are involved; one the surgeon who carries out the whole operational procedure and the other, an assistant who helps the surgeon with some elementary tasks. Nevertheless when a process of surgical intervention is underway, continuous and uninterrupted workflow should be assured. So to achieve such smooth work flow, a second assistant who can assist the surgeon by arranging and organizing the instruments swiftly is desirable. Almost all surgical microscopes used in dentistry possess stereoscopic vision and are equipped with coaxial lighting system. The magnification and clarity of vision they offer makes them ideal and convenient gadgets to be incorporated in various complex and sophisticated clinical procedures associated with dentistry. The microscope's ability to magnify the image depends mostly on the quality of the optics and the focal distance of the lens. The shorter this is, the greater the magnification achieved. The microsurgical tools can also be used in tooth preparation and final restoration of the tooth in fixed prosthodontics. In this regard some interesting observations are made by Leiknius and Geissberger. The study carried out by them shows positive results. The dental students using devices like low-magnification telescopic loupes made very less errors in preparation design and laboratory processing. The errors by these students were reduced to half while compared with another set of control group students who were not using magnification devices. The study also showed that the microscopes are extremely useful during the try-in and seating appointments. The magnification devices proved to be beneficial even to laboratory technicians who could trim the stone dies with utmost precision and improve the quality of prosthesis with the aid of microscopes. The clinical and operational advantages of microsurgery are exceptionally helpful in oral and maxillofacial surgery. A clearer and magnified view is particularly important in all surgical procedures for treating impacted teeth, and in particular for mucogingival surgical procedures to increase the width of attached gingiva by harvesting soft tissue grafts. The injuries and lesions to the sensitive nerves of the mouth area are surgically treated in a better way using microscopes. During lower molar and premolar level oral surgical treatment, or during the surgery of third molars, if appropriate care is not taken about the lingual flap, then the lingual nerve and the lower dental nerves are prone to injury. This could be well avoided by adopting microsurgery assisted by high end magnification. The history of dentistry tells us numerous amazing stories about how this science advanced and how time and again the technological progresses facilitated the evolution of treatment procedures. Achievement of excellence is the choice but a retrospective sight gives us the glimpses of technological milestones realized and a journey of science unfolds. Likewise, this is yet now another juncture where dentistry takes a huge turn. The Microsurgical procedures coupled with Microscopic Magnification offers an absolute clinical accuracy. The use of surgical microscopes have brought revolutionary transformation and opened up abundant avenues in front of the new age dentist. The principal necessities of gentle tissue management, perfect approximation, scrupulous hemostasis, and marginal tissue damage are the assurances of the microsurgical approach. Hence the role of microsurgery aided by magnification in dentistry is really vital. Conversely, when integrating the new technology, the lack of skill, training and practice can lead to physiological tremors resulting in inaccurate incisions, improper suturing etc. All these will end up with failure of the procedure which is very much technique sensitive. Thus to conclude, microsurgery is a treatment philosophy whose clinical horizons will continue to improve with operator experience and the willingness to employ previously unused basic optical magnification and ergonomic technique and technology. Sheets CG. The magic of magnification. Dentistry Today 1998;12:60-7. Tibbetts LS, Shanelec D. Periodontal microsurgery. The Dental Clinics of North America 1998;42:339-59. Carl Zeiss. Innovations for health. Innovation 2003;13:4-9. Apothekar H, Jako GH. A microscope for use in dentistry. J Microsurg 1981;3:7-10. Rino Burkhardt, Niklaus P. Lang. Periodontal plastic microsurgery. In: Jan Lindhe Niklaus P. Lang Thorkild Karring, eds. Periodontology and Implant Dentistry. 5 th ed. Iowa USA: Blackwell Munksgaard; 2008. p. 1029-42. Cohen ES. Microsurgery. Cohen ES, ed. Atlas of cosmetic and reconstructive periodontal surgery. 3 rd ed. Italy: B C Decker Inc; 2007. p. 433-8. Leonard S, Tibbetts LS, Shanelec DA. Principles and practice of periodontal surgery. Int J Microdent 2009;1:13-24. Ming Fang Su and Yu-Chuan Pan. Introduction to Microsurgery and Training. In: Abd El Salam El Askary, eds. Practical periodontal plastic surgery. 1 st ed. Iowa USA: Blackwell Munksgaard; 2006. p. 4-21. Christensen GJ. Magnification in dentistry-Useful tool or another gimmick? JADA 2003;134:1647-50. Owens ER: Practical microsurgery: A choice of optical aids. Med J Austr 1971;1:224-6. Carlos M. Microdentistry, concept, methods and clinical incorporation. Int J Microdent 2010;2:56-63. Burkhardt R, Hürzeler MB. Utilization of the surgical microscope for advance plastic periodontal surgery. Pract Periodont Aesthet Dent 2000;12:171-180. Calderon MG, Lagares DT, Vazquez CC, Gargallo JU, Gutierrez Perez JL. The application of microscopic surgery in dentistry. Med Oral Patol Oral Cir Bucal 2007;12:311-6. Pecora G, Andreana S. Use of dental operating microscope in endodontic surgery. Oral Surg Oral Med Oral Patthol 1993;75:751-8. Mines P, Loushine RJ, West LA. Use of the microscope in endodontics. A report based on a questionnaire. J Endodon 1999;25:755-8. Kratchman SI. Endodontic Microsurgery. Compendium 2007;28(6): 324-331. Shanelec DA. Periodontal Microsurgery. J Esthet Restor Dent 2003;15:118-123. Andrade PF, Grisi MF, Marcaccini AM, Fernandes PG, Reino DM, Souza SL, et al. Comparison between micro- and macrosurgical techniques for the treatment of localized gingival recessions using coronally positioned flaps and enamel matrix derivative. J Periodontol 2010;81:1572-9. Shanelec D, Tibbets L. A perspective on the future of periodontal microsurgery. Periodontology 2000, 1996;11:58-64. Glenn A. The Use of Extreme Magnification in Fixed Prosthodontics. Dent Today 2003;22:93-9. Leknius C, Geissberger M. The effect of magnification on the performance of fixed prosthodontic procedures. J Calif dent Assoc 1995;23:66-70. Juggins KJ. Current Products and Practice The Bigger The Better: can magnification aid orthodontic clinical practice? Am J Orthod 2006;33:62-6. Bertossi D, Vercellotti T, Podesta A, Nocini PF. Orthodontic microsurgery for dental repositioning in dental malpositions. J oral maxillofac surg 2001;69:747-53. Shourie V, Raisinghani J, Jain S, Todkar R. Microsurgery in Periodontics: A Review. Universal Research Journal of Dentistry 2011;1:19-24.